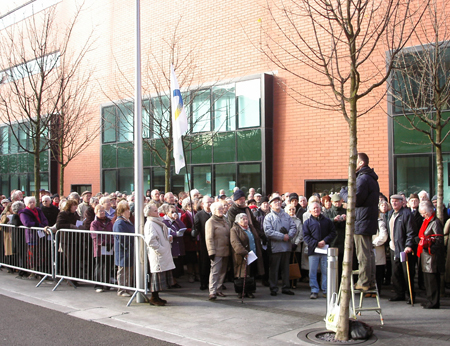 Around 300 Christians gathered this morning outside the National Assembly of Wales's T Hywel building to witness against the poetry reading by Patrick Jones. The gathering was something like ten times the number of those who turned up to hear Jones, at an half-full event hosted by LibDem Peter Black AM and Labour's Lorraine Barrett, a National Secular Society campaigner. Those present sang carols and hymns in the cold Cardiff air, there were also Bible readings and prayers at the solemn but good-natured event which lasted from 11.30am to 1pm. Patrick Jones said he was 'deeply shocked' at the turnout. His poems allege sexual relationships between Mary Magdalene, the poet, and Jesus Christ, and call for an end to religious worship. Assembly Members from the Conservative Party, Plaid Cymru, the Labour Party as well as Independent Trish Law opposed the reading. Stephen Green, National Director of Christian Voice, said afterwards: 'It was heartening that so many believers came out to stand up for Jesus Christ, exactly two weeks before Christmas. 'They recognised that it is a serious matter for Jesus Christ to be insulted in the seat of government of the nation of Wales . With Wales suffering more from the recession than any other part of the UK , this is a time when we should be pleading with God for mercy and deliverance, not insulting Him. Green revealed tonight that he has now emailed new LibDem leader Kirsty Williams asking her to distance herself and her party from the event. Patrick Jones carried out another poetry reading at Borders, a Cardiff bookshop, tonight. The store hired half-a-dozen security men in an expensive operation and the same number of police attended. Those desparate to hear the potty-mouthed poet were kept waiting for 15-20 minutes outside, which gave ample opportunity for Gospel witness to them. There was a prayer at the T Hywel event for Patrick Jones to repent, as many atheists have before, and turn to Jesus Christ. The Christian's prayer would be that just one of those who attended his reading at Borders find faith in Jesus Christ as well.